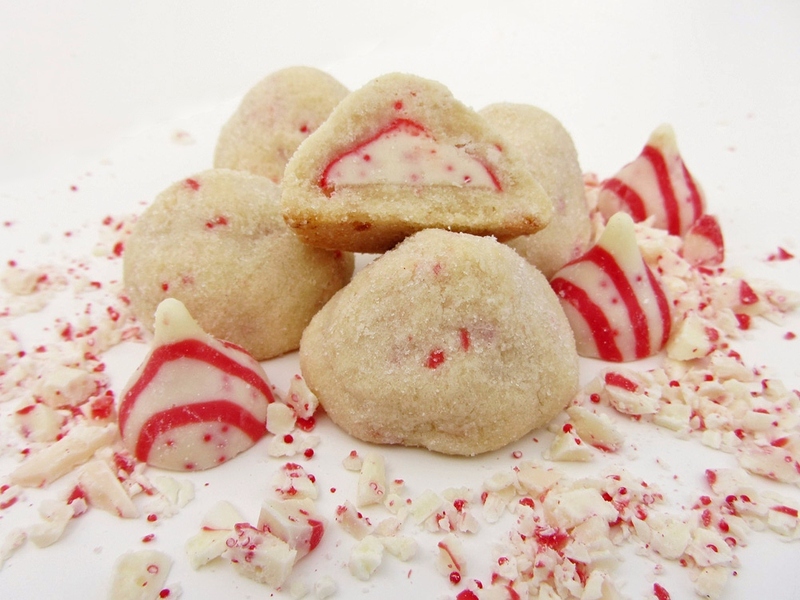 One of my favourite holiday cookie recipes that I discovered last year was Recipe Girl’s Candy Cane Kiss Cookies – they look so cute with the red and white swirled Kiss in the middle, and the chopped up Kisses throughout the cookie give it an amazing peppermint flavour. This year, I decided to switch them up a little by hiding the Kiss inside the cookie. 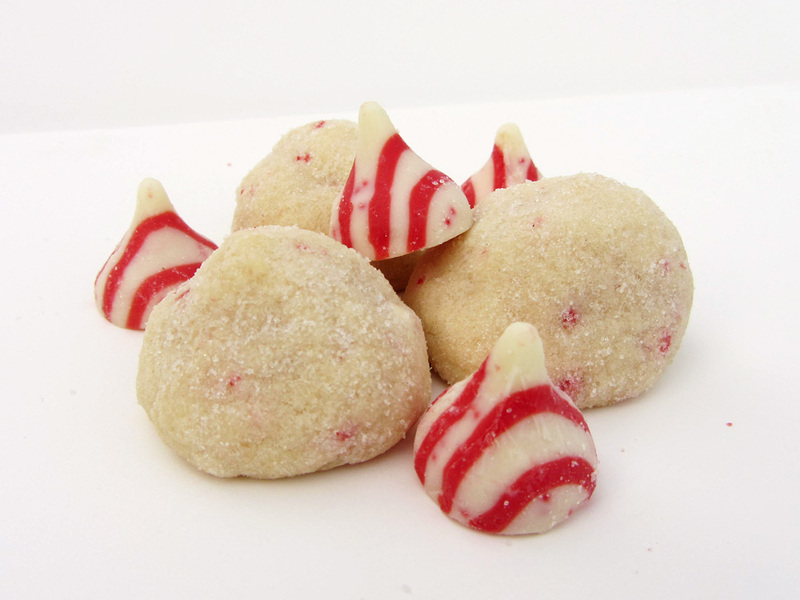 Though it hides the pretty swirls, it adds an element of surprise when you bite into the cookies and discover a delicious Candy Cane Kiss inside! These are the perfect holiday cookie because they’re nice and small, taste like a festive candy cane, and have a pretty sparkle from rolling them in sugar. I think I might like this version better than the original, mostly because they’re easier to make (because you don’t have to worry about the middle of the cookie baking all the way through, which I tend to have problems with) and they’re easier to store (without having to worry about the Kisses on top melting or breaking), but also because they’re just so different from the average cookie, and much more fun to eat! I’ve already made these twice this season – once for Ryan’s coworkers and once for a cookie swap at school, which was today (though sadly, I overbaked them a little this time) – and I’ll probably make them again closer to Christmas! *Note that you should only need to buy one 200g bag of Candy Cane Kisses for this recipe, as a bag contains about 45 Kisses and you need about 40 for this recipe. In a separate medium bowl, whisk together the flour, baking powder, and salt. Add the dry ingredients to the wet ingredients in the electric mixture in two additions, mixing well after each addition, until well blended. Stir in chopped Kisses. 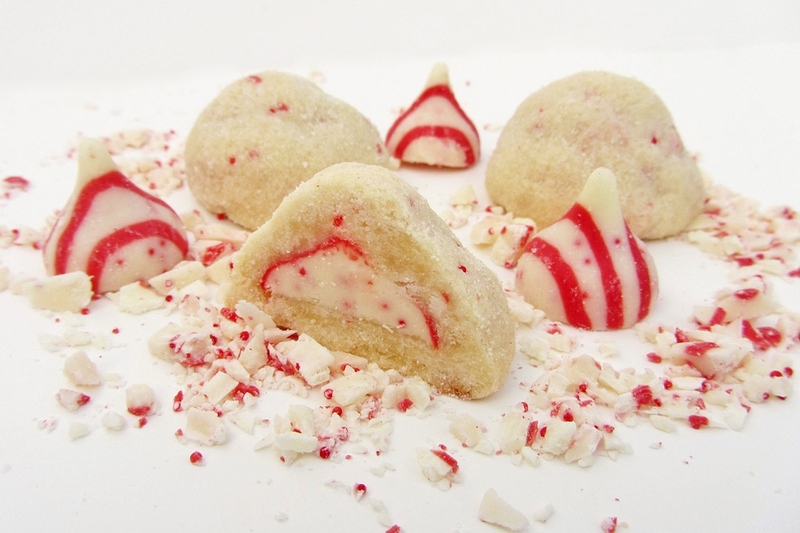 Scoop about 1 tablespoon of dough and press a Candy Cane Kiss into the middle of the ball of dough, molding the dough around the Kiss so that it’s completely covered by the dough. Try to smooth out any lumps; if the cookie looks lumpy before baking, it will look lumpy after being baked! Repeat with remaining dough; you should end up with about 30 cookies. Pour granulated sugar into a shallow bowl and gently roll each cookie in the sugar to coat. Place on a parchment paper-lined baking sheet and bake at 350°F for 10-12 minutes, then cool on a wire rack. To make things go quicker, I form 15 cookies first, put them in the oven, and while they’re baking I form the other 15 cookies. I'm submitting these cookies to the Holiday Recipe Exchange. Come join the fun at the My Baking Addiction and GoodLife Eats Holiday Recipe Swap sponsored by OXO. These cookies look so good! I'm definitely going to make them soon! These are so fun! I love the idea of hiding the Kiss in the middle. Personally I'm not a fan of peppermint, but you could easily switch in any type of Kiss. Thanks, Kris! I hope you like them as much as I did! Thanks, Rose! I'm not a fan of candy canes themselves but like peppermint flavour in other things. These cookies should definitely work with other types of Kisses though - Even just plain chocolate would look (and taste) really good! I absolutely LOVE candy cane kisses!! This recipe is a must try for me. Agreed! I think the Candy Cane flavoured Kisses are my favourite type .. I bet you'll love them even more in a cookie! Made them tonight for my son's class....yummy and so easy to make within a short time budget :) Thanks! Loved the flavor but my Kiss went flat any suggestions as what I might have done wrong? Hi Robbie - sorry to hear that! I haven't heard anyone else having this problem so I'm honestly not entirely sure what could have caused it, but my best guess to solve it would be to chill the dough. Because of the way the cookies are formed, the dough is handled a lot right before going in the oven, so try refrigerating the shaped cookies for 20 minutes or so before putting them in the oven. If your Kisses were also warm or soft, you can put them in the freezer for a while before starting to make the cookies. I also always bake my cookies in parchment paper instead of directly on the cookie sheet, which I think helps with the spreading. Hope that helps! Thanks, temperature was most likely my demise this was the 4th batch of cookies I prepared and the apartment was like a sauna! They still have great flavor but I will attempt this again next year! WOW! I'm definately making these for my friends at school! Great Pictures!